Have you ever seen horses that train managers on effective leadership strategies? My guess is – probably not yet, as this concept has been just launched in India! This training concept has its roots in Germany, where you can observe forward-thinking managers of Fortune 500 companies developing leadership skills with the aid of horses. Yes, you heard that right! Horses respond to body language and even pick up on the energy and intention of humans. That’s the reason why some people who share a very close connection with horses are referred to as “Horse-Whisperers”. Even without whispering, the horse picks up subtle signals of a person and responds to it. There are hundreds of books written on topics similar to “Secrets to success” in management. Most of these share effective strategies on how to be a better leader. The only problem with such strategies is the implementation. The most effective way to learn is by hands-on experience, that’s something we often miss out on, in our virtual and high-tech lives. Let’s take a young aspiring manager, for example, who might have all the credentials to become a great leader. But, until he actually leads a team and gains first-hand experience, the theoretical knowledge that he might possess will not suffice in helping him develop into an effective leader. For any company, it’s a challenging task to bring their future leaders to the next level, without compromising the performance of the team and allowing new leaders to make mistakes. 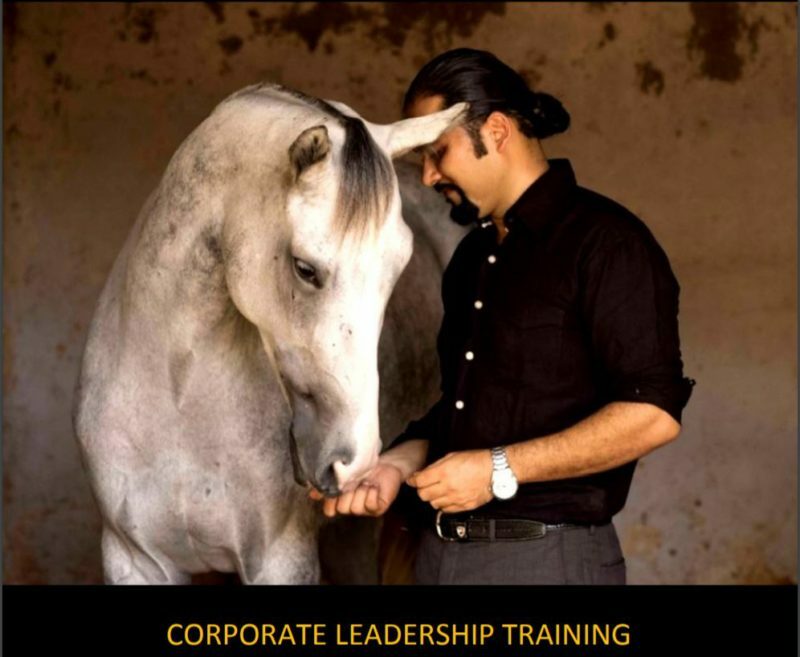 This unique workshop with horses gives leaders the rare opportunity to experiment and experience different leadership styles. The sessions with the horses are focused on generating enthusiasm, building trust and engaging in clear communication. Participants will practice with the horses, analyze in the group and reflect on their own behaviour encouraged by the trainer. The workshop starts with exercises where participants gradually lead the horse from simple to more advanced challenges, wherein, they are required to trust others and direct horses solely based on their body language. The aim of these exercises is to develop emotional intelligence and authenticity without the fear of failure. For many participants, this workshop might be the first time they must have interacted with a horse. Some of them may be afraid of these large animals – but within minutes of the activities, all their apprehensions quickly dissipate. It’s part of the training to overcome obstacles and expand your comfort zone, as these are integral qualities of great leaders. Can you recount the boring introduction of some professors and trainers? They start with something information that they must have studied 30 years ago that prompts the audience to fall asleep. However, the horses introduce themselves in a different way. Here you will observe five majestic horses galloping free in a large arena where you can even feel the ground vibrating. Some horses show-off their power, beauty, and elegance while others like to get close to the people standing at the fence. While observing the horses, even people who have no have had contact with animals whatsoever, do witness a fascinating similarity between the horses’ interaction and the communication amongst colleagues at work. The first challenge for the participants is to identify the hierarchy of the group of horses. Though the horses don’t carry around business cards, with an eye for detail, participants can identify the leader of the herd. Leadership is about leading, and that’s easier said than done. A few minutes into the training, participants are handed a rope and a horse: their task is to lead the horse through a small course of obstacles. After getting comfortable with a 500 kg animal and following in its footsteps, the participants start to realize that the horses mirror human behaviour. Confident people who can motivate the horse will discover that the animal follows them close behind through every obstacle, while some who like to enforce too much control or display a sluggish attitude will face difficulties. It’s learning by doing—participants who face challenges during the first exercises must adapt their behaviour and later attempt to master the advanced exercises as well. Every person in a team has individual preferences when it comes to attitudes at work. Some people work best in a team, some like to be on their own and others need an eagle’s eye watching them all the time. For a leader, it’s important to adjust his or her style according to the situation and person. This is practiced with the horses. Participants are asked to lead in different styles: switching between authoritative leadership, being a team player and leading by example. In times of change, it takes leaders who are flexible and can take the lead in challenging situations. After a full day with the horse, participants develop more empathy, authenticity and emotional intelligence. A leadership evaluation, as well as a short self-assessment, is part of the workshop to deepen the learning. The managers who have experienced this training, refer to the horses one of the best “Leadership-Coaches” they have worked with. One needs to experience it first-hand, step into the ring and get ready for an interaction with these beautiful animals. Workshops are conducted by Isabelle Hasleder at HQ Leadership India in Chennai as well as Bangalore.